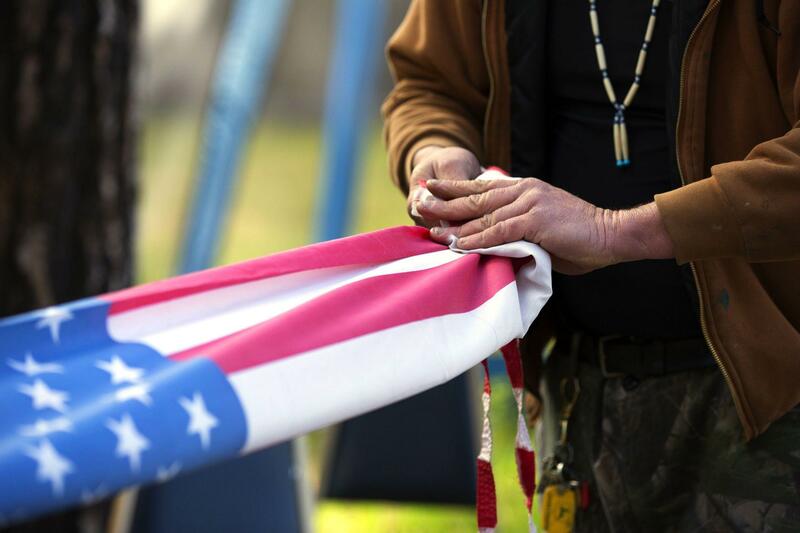 A tribal veteran handles an American flag at a gathering for former personnel and their families, which included a healing circle. “At this time ladies and gentlemen, we’ll go to the Warriors Society to give us a flag song…” says an emcee at last year's Siletz Pow-Wow. Because veterans hold a special status in Native American communities, they always lead the Grand Entry at these events. 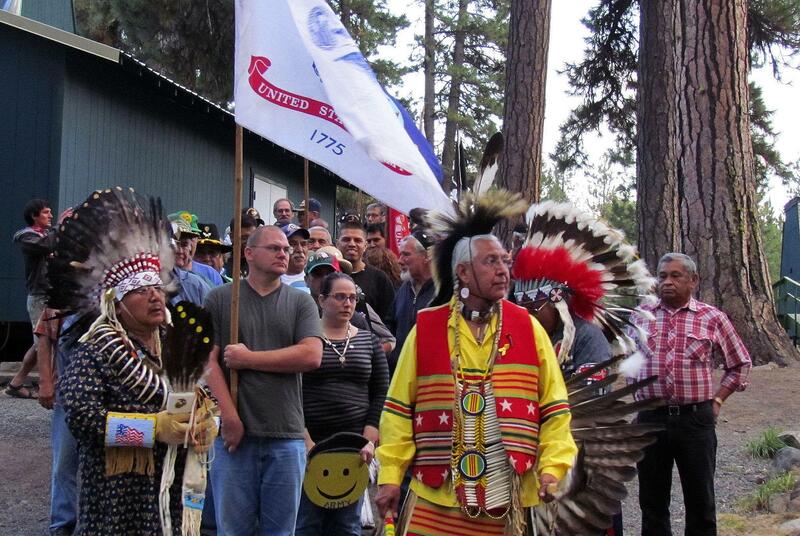 Native American vets lead the Grand Entry at the annual Camp Chapparal event hosted by the Yakama Nation, 2012. Organizers say it helps VA staff better understand the cultural needs of veterans from Indian communities. “Please, remember all of our veterans who put their lives on the line, and lost their lives…in defense of our indigenous lands…" continues the emcee, as veterans appear with their eagle staffs and finery. Indians have served the U.S. Army and other branches of the military, going back to the Revolutionary War. Many say it’s part of their “warrior code”, and proudly serve despite colonization and past conflicts with the U.S. government. Terry Bentley, Veterans Affairs Regional Specialist for the Western States, which includes Oregon. A member of the Kurok Tribe, Bentley has many relatives who've served in America's wars. “My family feels that protecting this land is their land, protecting their way of life, irrespective of what the government has done to our people," says Terry Bentley. She's a Kurok tribal member, and Veterans Affairs Regional Specialist for the Western States including Oregon. 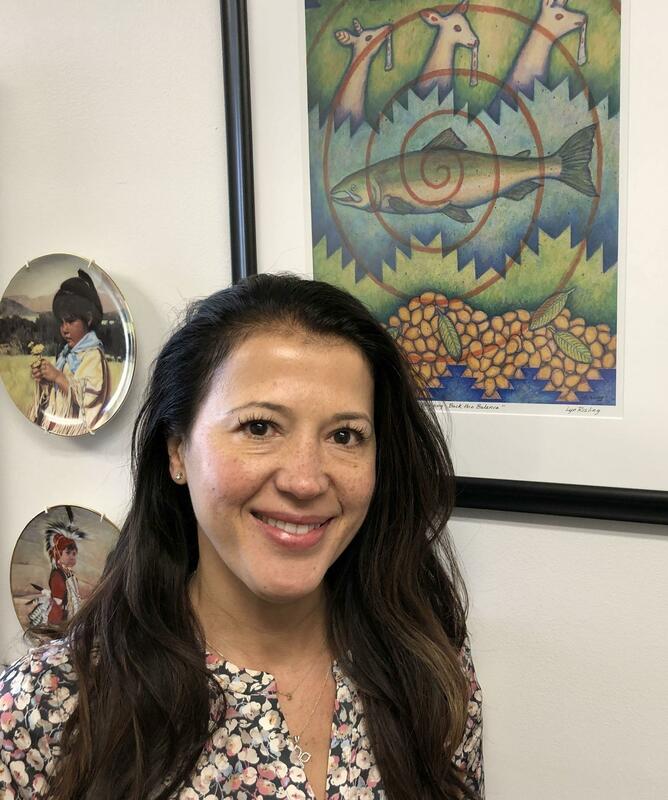 She’s helped the VA develop programs for Native Americans. 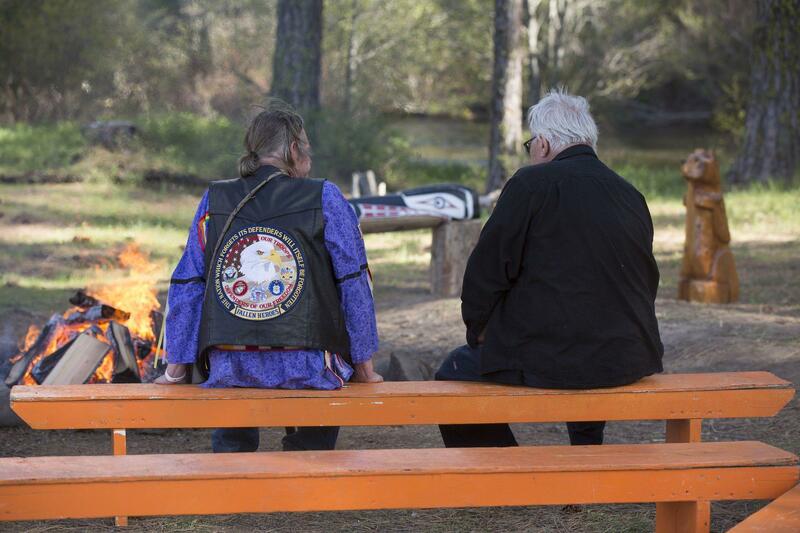 For many Native American veterans, participating in traditional ceremonies helps them deal with wounds and also bond with the soldier community. 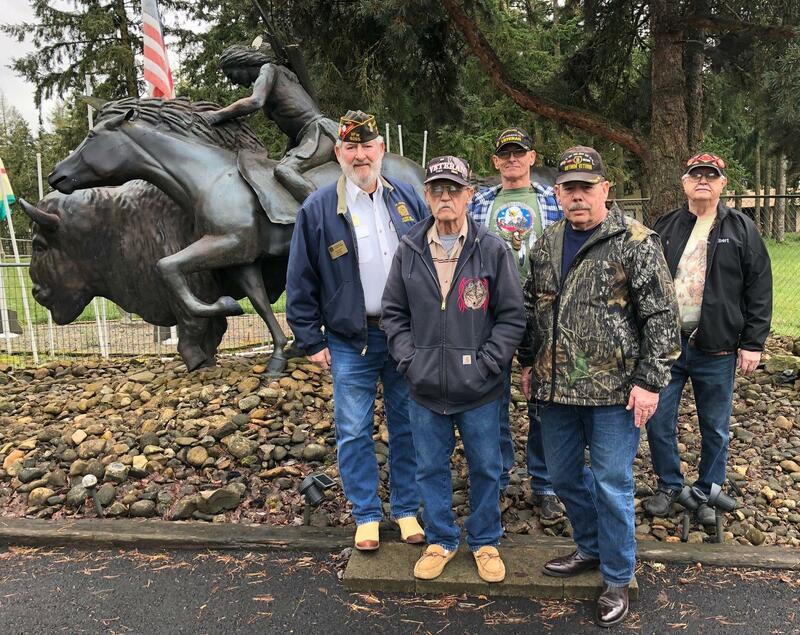 In an effort to improve services, the Oregon Governor’s Office and state VA are working to create a tribal veterans office for all nine federally-recognized tribes. “The important part is that culturally, tribal veterans take care of tribal veterans," says Mitch Sparks, Deputy Director for the Oregon VA. Since last year, two tribal vet centers have been launched, with the Warm Springs and Umatilla Tribes. Sparks says the Confederated Tribes of the Grand Ronde are having his staff over for a consultation soon. Besides improving digital services and record keeping, Sparks says it helps tribes with legal matters. 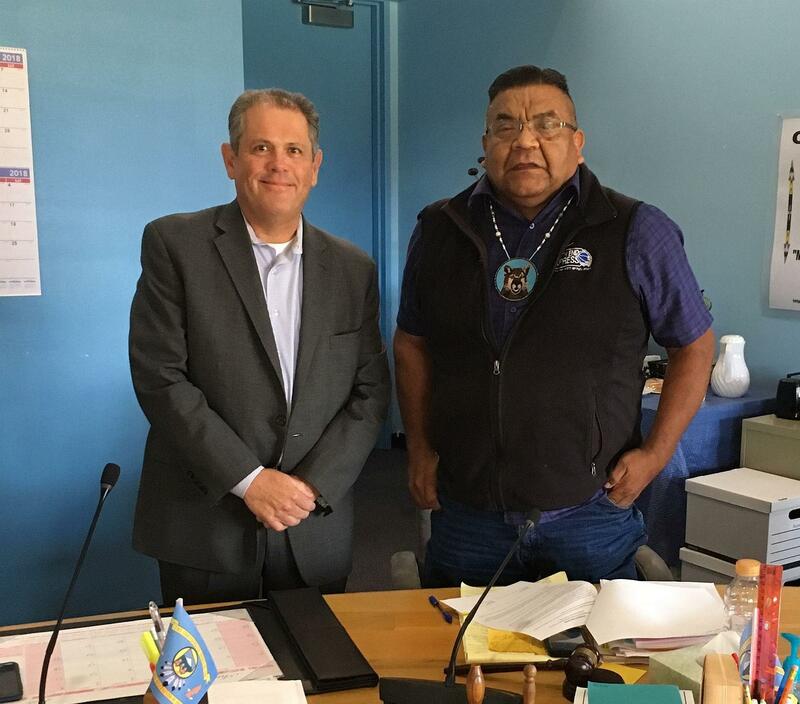 Oregon VA Deputy Director Mitch Sparks (left), and Confederated Tribes of Warm Springs Chairman Eugene Austin Greene Jr. (right), which received the first tribal veterans office in the state last year. “Tribal entities have a choice now…they can apply through the federal VA for their own power of attorney for their own tribe to represent their own veterans, or they can go through a state veteran’s agency like ourselves, to work under our power of attorney. And there are more federal efforts underway. This year, the U.S. Senate introduced a bill to improve VA outreach to native veterans. And a House resolution would officially recognize the Eagle Staff as the flag of the sovereign Indian nations…which pleases many elders. "I’m an eagle staff carrier, I have a tremendous eagle staff, the feathers have been gifted by combat veterans,” says 83-year-old Bill Stam. On the outskirts of Jefferson, Oregon, near the town cemetery, Stam presents his memorial started in 2013. The Oglala Lakota veteran served in Korea and Vietnam, and has funded this site with his own money and donations. An all-native Honor Guard dedicated to promoting the All Nations Native American Veterans Memorial in Jefferson, Oregon. From left to right: Ivan 'Bud" Jones (Oglala Lakota/Cherokee, Vietnam War); Bill Stam (Oglala Lakota, Korean and Vietnam Wars); Donald Vanderburg Jr., (Cherokee/Lakota, Afghanistan conflict); Tobie Davie (Cherokee, Vietnam War); and Albert Dean Miller (Toma-Iowa, Navy service). “This is the All-Nations Native American Memorial," he says, gesturing towards a life-size sculpture behind him. "A native on a horse, and he’s hunting buffalo. Last year we had almost 600 visitors, 32 states, and seven countries." Stam is joined by his honor guard, a group of friends who are also native veterans. They’ve worked on a grassroots level to promote the memorial, which includes the names of Indian Codetalkers, and Congressional Gold Medal recipients. 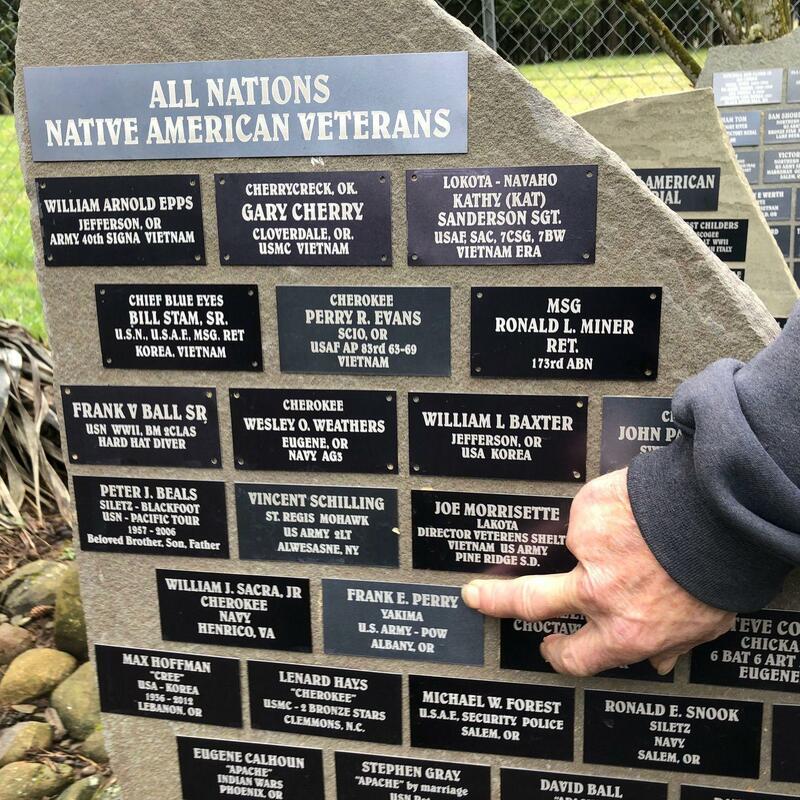 Bill Stam points to some of the names listed on his All-Nations Native American Veterans Memorial in Jefferson, Oregon. “Can you untie this, Don?” asks Stam, of his fellow veteran, Donald Vanderburg Jr. His friend obliges, pulling back the plastic covering shielding the names from the rain. “Mia Thom, she did 40 years in the military, she’s Vietnam, Desert Storm, Iraq, Afghanistan…" reads Stam. Vanderburg Jr. is an Afghanistan veteran of Cherokee-Lakota descent. He says he’s done archery and ceremonial sweats here, which has helped his PTSD. “I love it up here, this is my zen!" he laughs. "This is where I come up here to find peace." “He’s changed a lot in a year,” adds Stam. 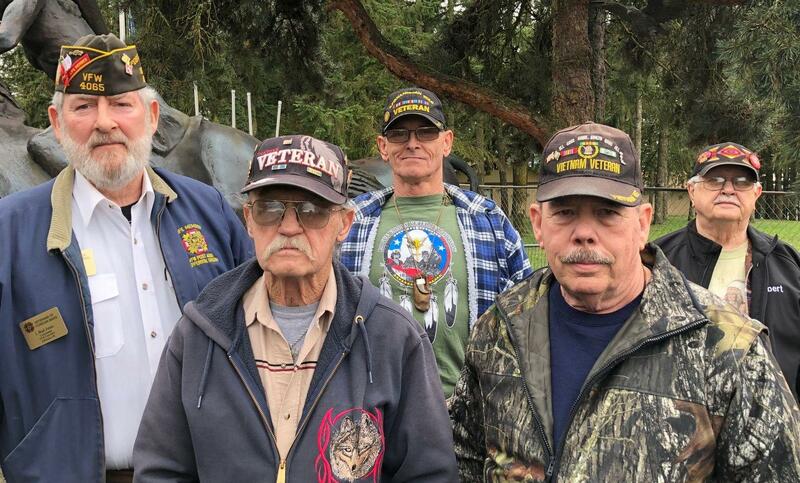 From left to right: Ivan "Bud" Jones, Bill Stam, Donald Vanderburg Jr., Tobie Davie, and Albert Dean Miller at the All-Nations Native American Veterans Memorial near the Jefferson cemetery. Another veteran is Ivan “Bud” Jones, of Cherokee-Lakota heritage and a VFW post commander. He says he wants Oregon lawmakers to show more support for the memorial, and native veterans in general. As Jones and others work to highlight this memorial in Oregon, another one underway in Washington D.C. will also help share that history. 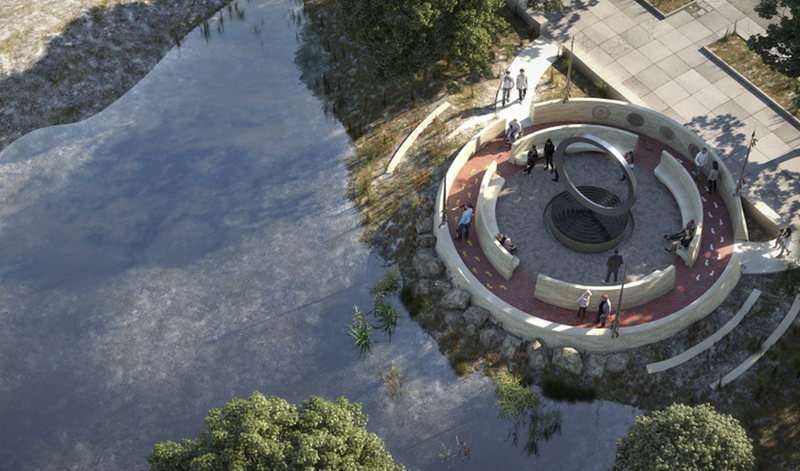 In September, groundbreaking begins on the National Native American Veterans Memorial, with a dedication slated for November 2020. Concept design for National Native American Veterans Memorial, scheduled to begin work in fall of 2019. Its design was done by Harvey Pratt, of the Cheyenne and Arapaho tribes of Oklahoma. 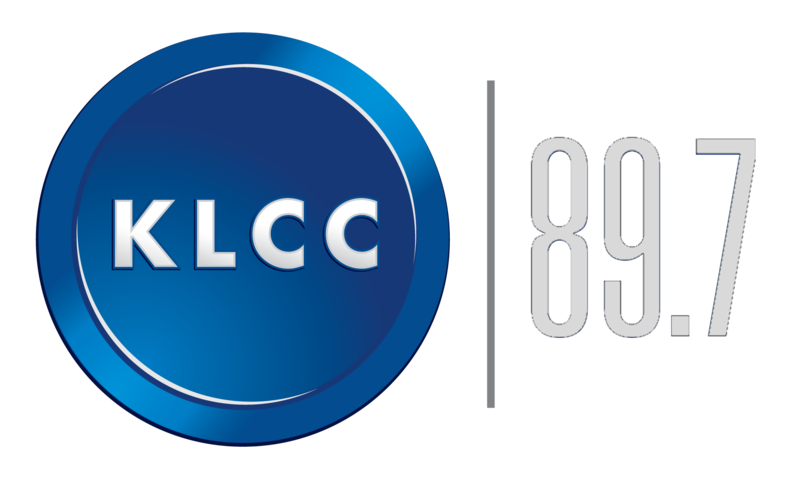 Note: Funding for KLCC's "Borders, Migration, and Belonging" series is provided by the Wayne Morse Center for Law and Politics at the University of Oregon.